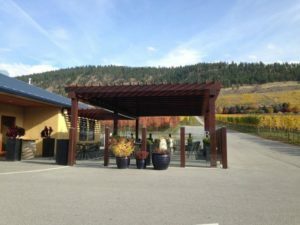 Four years ago, I headed up to the Naramata Bench to check out a couple of new wineries, including Upper Bench. At the time, they had just opened, many of their wines were sold out, and there was a limited selection of their delectable cheeses. But what I tasted was very good and I decided to stop in this year on my way from Kelowna to Osoyoos. As luck would have it, Shana, the ‘Big Cheese’ – half of the duo responsible for this small family-owned winery (husband Gavin Miller is the winemaker) – was in the tasting room. 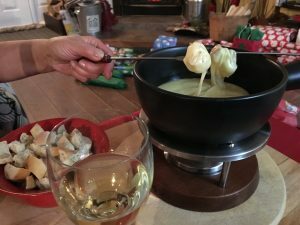 So, we were treated to her expertise and enthusiasm as we tasted three of their unique cheeses, along with several wines. I make no claim to any cheese expertise like our cheese Sommelier Vanessa, mark my words, the Brie seemed wonderfully creamy to me, with a lovely soft yet textured rind. The Gold offered a firmer texture, a golden washed rind and a slightly nutty flavor. The Grey Baby, named for her cat, had a lovely bloomy grey rind, almost no typical blue cheese veining but an absolutely melt-in-my -mouth texture and delicate flavours. Yes, I found cheese heaven! The U&Brie was paired with their 2015 dry Riesling – they’re already into the 2015 wines due the fast pace of sales. 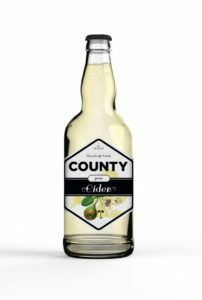 Light-mid weight, the nose is floral and fruity with underlying mineral notes, the palate crisp and bright offering flavours of orchard fruit and lemon zest, the finish tart and tangy yet fruity. The 2015 Chardonnay continues to be made with an emphasis on purity of fruit, half the wine aged only 3 months in French oak, the balance in stainless, so that the delicate notes of spice and warm pastry garnish the aromas and flavours of tropical fruit, melon and juicy pear, while a hint of pithy grapefruit adds tang to the creamy finish. It provided a great pairing with the Oka-like Gold cheese. 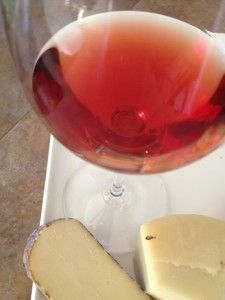 The Grey Baby cheese was a perfect complement for the 2014 Pinot Noir red wine – an elegant, silky wine with lifted floral notes, bright red fruit and hints of earth and spice. Medium bodied, it’s intensely flavourful, subtly structured, the flavours of ripe red fruit interwoven with delicate notes of spice and mineral. The Yard Wine is a signature wine, a Bordeaux-style red wine blend of co-fermented Merlot and Cabernets (mainly Franc) that’s medium-full bodied, full of aromas and flavours of sweet black and red fruits, hints of chocolate-coated caramel and spice as well as complementary undertones of tomato leaf and earth. Underpinned with ripe tannins and fresh acidity, it’s a very approachable, gulpable wine! 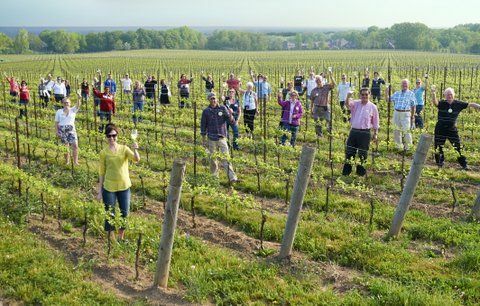 While the small production of Upper Bench wines means that they won’t be found in the LCBO, you can always join their wine and cheese clubs. Another sunny day found us winding our way along the east side of Skaha Lake from OK Falls toward Penticton. We made our way up the bench to Painted Rock, where we once again struck gold, as proprietor John Skinner was at the tasting bar. John worked in the financial industry in Vancouver for many years, all the while developing his fascination with fine wines and the wine industry. In 2004, he and his wife Trish purchased a former fruit orchard on the bench that had lain fallow for almost 2 decades. About 25 acres were planted to a variety of vitis vinifera clones in 2005 and 2006. 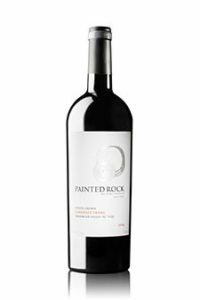 As a result of his interaction with the nursery from which he sourced his clones, John was contacted by wine consultant Alain Sutre (who also consults with Don Triggs’ Culmina estate winery), who continues to work with Painted Rock to this day. As an example of the valuable input he provides, during the extremely hot 2015 vintage, Alain counselled John and his team to allow the vine canopy to grow to ensure shading of the grapes from the sun and to prevent scorching. This allowed for a longer hang time, good maturation of the fruit and retention of acidity. John’s commitment to premium winemaking and his delight in his property and the local trails was evident as he interspersed our tasting with anecdotes of the recent vintages and photos of local pictographs he has found on the granite outcroppings. The 2015 Rosé wine is a Saignée, an assemblage of his red grapes, including Merlot, the Cabernet Sauvignon and Cabernet Francs, Malbec, Petit Verdot and Syrah. 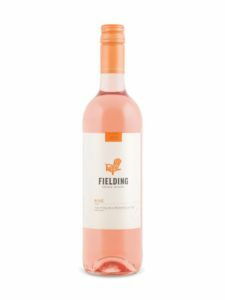 A lovely salmon hue, it shows some residual sugar and warmth from the hot vintage, aromas and flavours of strawberry/rhubarb compote, dried cherry and dried herbs, and a lovely silky, fruity finish. The 2013 Merlot, aged 18 months in a combination of new and second fill French oak, is dry, full bodied red wine with tangy, showing rich lifted aromas and flavours of black cherry, plum and raspberry, warm sweet spice and hints of menthol and herbs, underpinned by ripe tannins and a fresh texture. The 2014 Cabernet Franc was a particular favorite, seducing with its lifted floral notes of red rose and violet, the sweet hints of baking spice, cocoa and plummy fruit, and a subtle whiff of graphite. 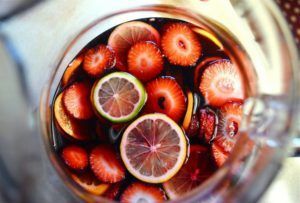 Dry and firmly structured, it’s loaded with flavours of black currant garnished with notes of herbs and cracked pepper. Finishing long and dry, this red wine shows great cellaring potential. Once again, none of these wines are on the LCBO website, but John also offers a wine club. Nestled on a bench just above Lake Osoyoos, the Nk’Mip Cellars is as much a part of the land as its owner/operators, the Osoyoos Indian Band. In a partnership with the then-Canadian wine conglomerate, Vincor, the band established the first indigenous-owned winery, and winemaker Randy Picton was engaged in 2002, just in time for the first harvest. Located on a small campus that includes the Desert Cultural Centre, the Sonora Dunes Golf Course and Spirit Ridge Resort (where I stayed), it was inevitable that I would wander over to Nk’Mip to see how the 2016 harvest was progressing (slowly due to a very cool fall and an early killing frost) and to taste a few wines from recent vintages. It felt like a celebration to be there, as Nk’Mip has recently been named 2016 Winery of the Year, having been in the top 10 in the last four years, and the recent purchase of Constellation Brands Canadian wine properties (including its investment in Nk’Mip) by the Ontario Teachers’ Pension Fund means that the winery is now fully in Canadian hands once again. 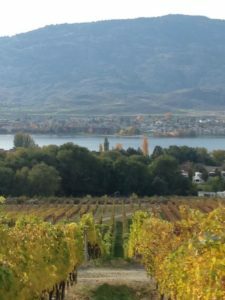 The view from the winery is idyllic, rows of golden-leaved vines marching down the sloping vineyard to Lake Osoyoos, the small resort town of Osoyoos rising from the lake to a backdrop of rugged Sonoran desert mountainscapes. Randy has honed his craft so that no matter the level of wines tasted, you can expect deftly crafted high quality wines made to his exacting standards. To quote Randy, “My approach is to focus on every detail in the vineyard in order to bring the best possible grapes to the winery. The vineyard is expressed in the bottle.” He’s assisted in the winery by Justin Hall, an Osoyoos Indian Band member who has studied viticulture and oenology in Canada, as well as New Zealand, and worked in the industry in Australia as well as at Nk’Mip. 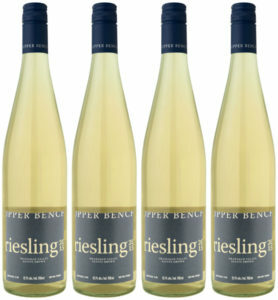 You see his experience in cool climate winemaking in the vibrant, fresh 2015 Pinot Blanc, a great value white wine that offers subtle aromatics of citrus and orchard fruit, with a clean, crisp flavours of lemon, pithy grapefruit mineral through a zesty finish. The 2013 Merlot is an easy-going crowd pleaser, a dry mid-weight red wine aged 12 months in a combination of French and American oak, offering flavours of cherry and plum, herbs, spice and cocoa through a nice lively finish. The 2014 Syrah from the signature QwAm QwMt tier is produced from estate fruit, the wine aged 18 months in French oak. It’s a complex, full bodied deep purple wine with layers of flavours–dark berry fruits, exotic spice, Okanagan sage, cracked pepper with notes of dark chocolate and coffee bean wrapped in a firm structure. It’s a great value and worthy of cellaring. 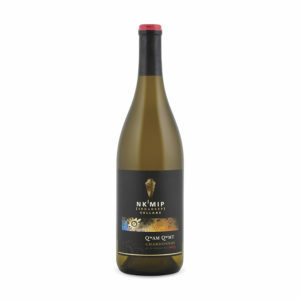 The Nk’Mip Qw’Am Qw’Mt Chardonnay 2013 is listed on the LCBO website (#391813), and for other wines you can always contact the winery about their wine club. There you go…3 more reasons to pack your bags and head to British Columbia wine region! Move over maple syrup, there is a new kid on the block that deserves the spotlight. 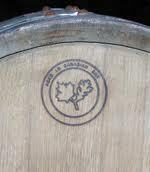 Introducing Canadian made wines aged in barrels made from Canadian oak trees. This is 100% Canadiana just like Beaver Tails, the Bluenose II….these special wines will impress you. In fact, Canadian Oak Barrels are not brand spanking new, yet in true Canadian style we are not shouting from the roof tops about them. Not only do the wines taste good, there is a great story how the idea was conceived- let’s just say, some beers were involved! About 5 years ago (or maybe it was 7), a handful of winemakers were ‘talking shop’ at a backyard BBQ. Conversations lead to wondering what a barrel made with native Canadian oak would do to their wines. After a lot of research, they found a cooper (barrel maker) in California who would make these one-of-a-kind barrels. Next step was to find native oak trees – luckily found in Brantford, Ontario. The wood staves were cut and shipped in hockey bags (brand new ones of course!). Their “what if moment” & hard work paid off when several Canadian Oak barrels arrived at the wineries. From the get go, there were fewer than 10 winemakers across Canada who barrel age some of their wines in this special oak – including Tawse Winery, Featherstone, Malivoire, Strewn, Sandhill Wines to name a couple. Now there is a cooper in Canada making the barrels (note the unique maple leaf stamp on the barrel head – right) and over 50 winemakers from coast to coast have experimented with Canadian oak barrels. Derek Barnett (left), co-owner & winemaker at Lailey Vineyard is a big enthusiast of Canadian Oak. 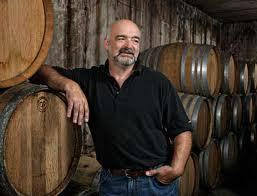 He barrel ages some of his Chardonnay, Pinot Noir and Meritage wines aged in Canadian oak. These wines have been receiving rave reviews from day 1. Savvy Sommelier Tasting Notes: “This wine makes me think of buttered popcorn” suggested Eva. Golden straw colour with aromas of wildflower honey, tropical fruit (think coconut & sweet citrus) with some nuttiness – walnut perhaps?. Rich & round mouthfeel with flavours of lime, stone fruit & baking spice with minerality & a lengthy warm finish. Suggested Food Pairing: Given the rich aromas & flavours of this Chardonnay try the Chicken & Farfalle with Creamy Walnut Sauce recipe. Now that you are ‘in the know’, seek out wines aged in Canadian Oak barrels. 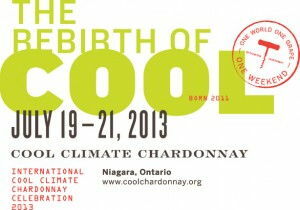 You will definitely find a range of Chardonnays at next weekend’s Cool Climate Chardonnay Conference (aka i4C) in Niagara. 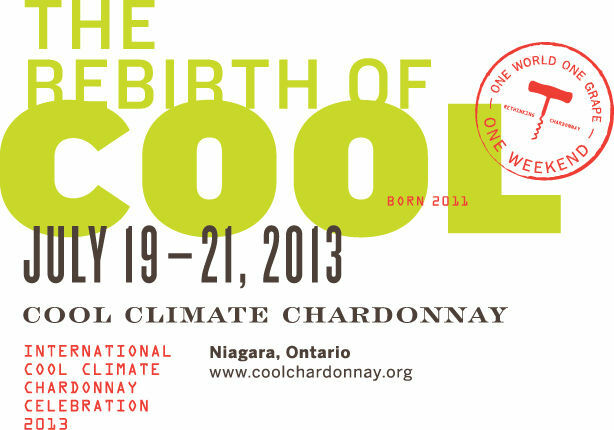 This 3 day spread give you the opportunity to learn & taste Chardonnays from every corner of the wine world as well as be WOWED by Canadian Oak Chards. Klaus Reif (pronounced ry-fe) is one of the pioneers of the Canadian wine industry. He immigrated from Germany in 1977 & transformed an orchard into a vineyard. By 1983, Reif Estates Winery opened. 3. The wines are made under stricter conditions and with greater TLC such as handpicked fruit. “Reif’s First Growth collection of wines is one of Klaus’ & winemaker Roberto (aka Rob) DiDomenico, dream come true & it is something that they are completely proud of”, beams Andrea. To date, only four First Growth wines have been crafted by Reif Estate’s (2001, 2002, 2007 & recently, 2010 has been named exceptional). You are in for a treat with this wine! Savvy Sommelier Tasting Notes: Bright ruby red with enjoyable aromas of cherries, raspberries, leather & pencil shavings waft from the glass. The palate will totally blow you away with flavors of sour cherries, ripe raspberries & dark chocolate. With a velvety mouth feel & a long lingering cherry finish, this is an incredible wine. Suggested Food Pairing: Peking duck or BBQed lamb chops with a rosemary rub, even grilled salmon would pair very well. Cellaring: Drinking well now through to 2015. Reif Estates Winery has been a feature winery in our Savvy Selections wine of the month club. Read more about Reif & their wines in our Savvy eZine. Want to purchase this uber premium wine? Simply contact us to arrange a special delivery of this wine or a mixed case of other Reif wines that we recommend. Or better yet, subscribe to Savvy Selections & wines will be delivered to your home or office! You’ll want to buy 2, 3 or 5 bottles of this wine! Brothers Kal and Nirmal Gidda opened Mt. Boucherie Family Estate Winery & recently celebrated their 10th anniversary. They are a true family business success story! 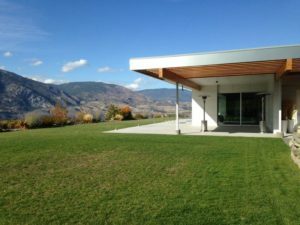 Located in West Kelowna’s Lakeview Heights area, this winery is only a five minute drive from downtown Kelowna, British Columbia across the scenic Okanagan Lake floating bridge. Winemaker Jim Faulkner and his team, have grown Mt. Boucherie over the years to produce a total of 21 reds, whites and Icewines amounting to 25,000 cases! Semillion is a rare grape variety in British Columbia vineyards, yet Jim has created a stunning wine. Savvy Sommelier Tasting Notes: Full bodied white wine with smooth texture & aromas of fresh apple tart with a shortbread crust, beeswax with some refreshing acidity. Smooth texture in the mouth with a full bodied nutmeg & white pepper finish that goes on forever. Food Pairing Suggestions: Serve with paella, blackened catfish, pan fried scallops or smoke salmon. Want to buy this wine? Run. . . don’t walk to your nearest LCBO as this wine is now on the store shelves in Vintages. We would strongly recommend to buy two or three or five! bottles because this wine will sell quickly. 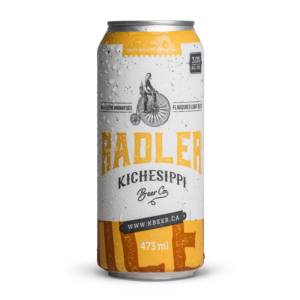 Once it is gone at the LCBO, you will have to contact the winery directly to arrange an order. Enjoy! Many winemakers will tell you that ‘wine is made in the vineyard’. This is very true at Riverview Cellars located in the heart of Niagara-on-the-Lake, Ontario. Similar to neighbouring Colaneri Estates , Cattail Creek & Pondview wineries, at Riverview, the Pillitteri family are grape growers first & they recently opened a winery. Since older vines, produce better fruit to make better wine, get ready to taste the age of Riverview’s vineyard with each sip of this Syrah! Our Sommeliers rave about this wine. Savvy Sommelier Tasting Notes: Whether you call it Syrah or Shiraz, the wine is made with the same grape variety. This bold wine overflows the glass with BIG aromas of red & black plums, berries with warm spices that carries into the taste…then lingers forever. Suggested food pairings: Fire up the BBQ! Serve with steak with blue cheese, beef tenderloin with all the trimmings, even hamburgers would be delicious. And it would be delicious with a piece of dark chocolate cake too! Want to buy this wine? Subscribe & it will be delivered! 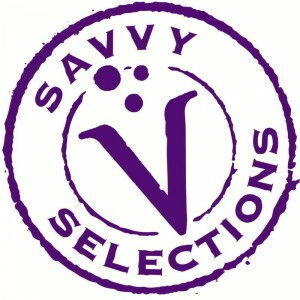 Riverview has been a feature winery in our Savvy Selections wine of the month club. You won’t find this outstanding wine on the shelves at the LCBO. Would you like this wine? 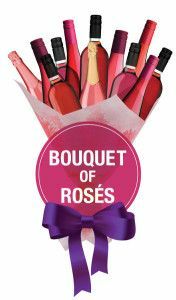 Subscribe to our wine of the month club or call on us to make the arrangements for a special delivery to your home or office!